Six Earth system models that include an interactive carbon cycle and have contributed results to the 5th Coupled Model Intercomparison Project (CMIP5) are evaluated with respect to Arctic Ocean acidification. Projections under Representative Concentration Pathways (RCPs) 8.5 and 4.5 consistently show reductions in the bidecadal mean surface pH from about 8.1 in 1986-2005 to 7.7/7.9 by 2066-2085 in the Canada Basin, closely linked to reductions in the calcium carbonate saturation state ΩA,C from about 1.4 (2.0) to 0.7 (1.0) for aragonite (calcite) for RCP8.5. The large but opposite effects of dilution and biological drawdown of DIC and dilution of alkalinity lead to a small seasonal amplitude change in Ω, as well as intermodel differences in the timing and sign of the summer minimum. The Canada Basin shows a characteristic layering in Ω: affected by ice melt and inflowing Pacific water, shallow undersaturated layers form at the surface and subsurface, creating a shallow saturation horizon which expands from the surface downwards. This is in addition to the globally observed deep saturation horizon which is continuously expanding upward with increasing CO2 uptake. The Eurasian Basin becomes undersaturated much later than the rest of the Arctic. These CMIP5 model results strengthen earlier findings, although large intermodel differences remain: Below 200 m ΩA varies by up to 1.0 in the Canada Basin and the deep saturation horizon varies from 2000 m to 4000 m among the models. Differences of projected acidification changes are primarily related to sea ice retreat and responses of wind mixing and stratification. Management of marine ecosystems requires spatial information on current impacts. In several marine regions, including the Mediterranean and Black Sea, legal mandates and agreements to implement ecosystem-based management and spatial plans provide new opportunities to balance uses and protection of marine ecosystems. Analyses of the intensity and distribution of cumulative impacts of human activities directly connected to the ecological goals of these policy efforts are critically needed. Quantification and mapping of the cumulative impact of 22 drivers to 17 marine ecosystems reveals that 20% of the entire basin and 60–99% of the territorial waters of EU member states are heavily impacted, with high human impact occurring in all ecoregions and territorial waters. Less than 1% of these regions are relatively unaffected. This high impact results from multiple drivers, rather than one individual use or stressor, with climatic drivers (increasing temperature and UV, and acidification), demersal fishing, ship traffic, and, in coastal areas, pollution from land accounting for a majority of cumulative impacts. These results show that coordinated management of key areas and activities could significantly improve the condition of these marine ecosystems. Upwelling-favorable winds have increased in several coastal upwelling systems, and may further increase in the future. The present study investigates the effects of upwelling intensification on ocean acidification in the California and Canary Current Systems (CSs). Model simulations show that the volume of water undersaturated with respect to aragonite almost triples in the California CS under a doubling of wind stress. In contrast, the same wind perturbation results in the disappearance of undersaturation in the Canary CS. These contrasting responses arise from the differences in the relative contributions of circulation and biological processes to aragonite undersaturation in the two systems and the sensitivity of these processes to upwelling intensification. When combined with rising atmospheric CO 2 and increased stratification, upwelling intensification accentuates acidification in the California CS and dampens it in the Canary CS. 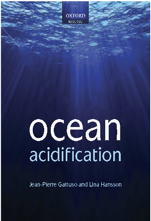 These findings highlight the challenge to predict the future evolution of ocean acidification in regions subject to concurrent disturbances. 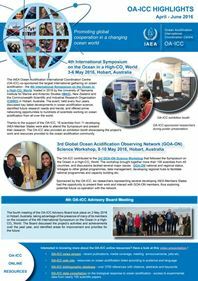 This assessment report presents the results of the 2013 AMAP Assessment of Arctic Ocean Acidification (AOA). This is the first such assessment dealing with AOA from an Arctic-wide perspective, and complements several assessments that AMAP has delivered over the past ten years concerning the effects of climate change on Arctic ecosystems and people. The Arctic Monitoring and assessment Programme (AMAP) is a group working under the Arctic Council. • recommend actions required to reduce risks to Arctic ecosystems. An ecosystem model, NORWECOM.E2E including a module for the carbonate system, has been used to investigate the effects of rising atmospheric CO2 and climate change on the ocean’s acid–base state in the Nordic and Barents sea. Using the 20C3M control run and the A1B emission scenario, a downscaling of the GISS-AOM global climate model has been used to force the ecosystem model for a reference (1981–2000) and a future climate (2046–2065) simulation respectively. The simulations demonstrates how the saturation state of seawater with respect to aragonite will evolve, with a shoaling of the saturation horizon of approximately 1200 meters in the Nordic Seas, and a large increase in area extent of under saturated surface waters. The simulated pH change in the surface water is − 0.19 from 2000 to 2065, while the model estimates an almost doubling of the CO2 air-sea flux in the Barents Sea increasing the uptake from 23 to 37 gC m− 2 year− 1. The main driver for the modelled changes in surface fCO2 is the change in DIC, with only minor contributions from temperature, salinity and total alkalinity. The opening of the Suez Canal in 1869 has created a pathway of migration for biota from the Red Sea into the Mediterranean Sea. This has a substantial impact on the marine ecology, endangering many local and endemic taxa. Larger foraminifera of the genus Amphistegina are among the most successful invaders, as evidenced by their abundance, ubiquity and wide extension in the Aegean and Ionian Sea. Because global climate change will amplify the entry and range expansion of tropical species in the Mediterranean, the interest in predicting species ranges and forecasting potentially negative impacts on ecosystems has grown substantially. We modeled the potential distribution of Amphistegina spp. and projected the result on future climate scenarios for 2050 and 2100, to predict range extensions of the taxon in future and compare these to range expansions under warm climate as documented in the fossil record. Results indicate that further warming is likely to cause a continued range extension, and predicts dispersal along the central Mediterranean coasts. The average range expansion rates were computed between 11.76 and 13.82 km per year, and are projected to lead to a total range expansion of 525 km (4.71° latitude) and 1035 km (11.87° longitude) in the year 2100. The results corroborate findings from the fossil record showing that some larger symbiont-bearing foraminifera cope well with rising water temperatures and are beneficiaries of warmer climate. It is anticipated that the ongoing warming trend will convey the northwestward migration of Mediterranean amphisteginids, implicating substantial consequences for marine ecosystems.